Jaw or temporomandibular joint pain is quite common after an auto collision, even when there is no one trauma to the face. The problem can be bewildering to health patients, as, in many cases, the jaw symptoms may not surface immediately after the injury, in some cases takes weeks or perhaps months to develop. 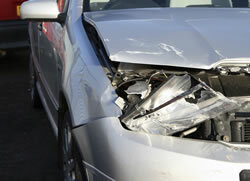 New research over the last ten years suggests that jaw pain after an auto injury often originates in the spine. When your neck is injured during a collision, the pain signals travel from the spinal cord to your brainstem. Here, nerve fibers from many different areas of the body converge together before they pass to the pain hubs of your brain. When these nerve fibers meet, the impulses can get mixed up and crossed. It's akin to the arm pain felt by someone having a heart attack. The nerve signals from the heart cross with the nerve signals of the arm, and the patient feels the pain in the arm instead of the actual source. The nerves of your face connect in the neck with pain receptors from your spine. When chronic pain impulses from your injury overstimulate the nerve junctions, you can feel pain in other parts of your head, including your jaw.And as the jaw is experiencing discomfort, it can cause the muscles in the head to tense up, causing more pain. Chiropractic helps by helping your body repair the primary injury in the neck, which then improves pain in other parts of your body. If you've been in a crash, Dr. Holland is here to help. We can help establish the root cause of your pain and formulate a plan of action to help you reclaim your health. We have helped many patients in St. Louis, MO improve from these sorts of injuries since and we might be able to help you! Call our office today at (314) 588-9100 for an appointment or for more information.